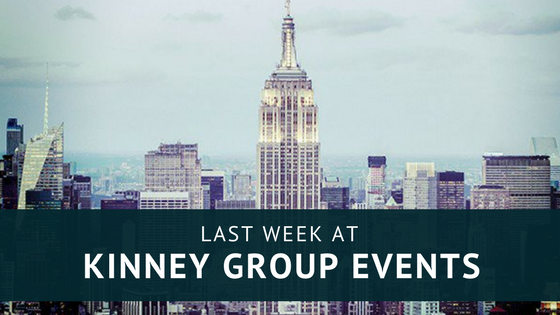 This past week was exciting as Kinney Group was able to help launch the “Timing the Skies” campaign for Hamilton Watches at NoMo Soho on Crosby Street in New York. We began communications with the team at Hamilton over two weeks ago when we were contacted by them for our audio-visual rentals. The day finally arrived to bring in the equipment and get started with the set-up. The KGE Crew made certain that everything arrived in perfect condition and was ready to go! 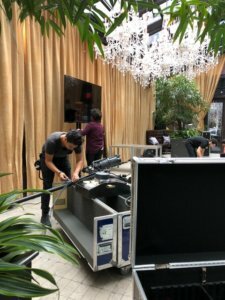 Here our techs are unloading and beginning the task of getting the 70” TV monitors ready. Next, the equipment for the spotlights were installed. Here the technician is setting up the lights to give the best exposure to the product displays. 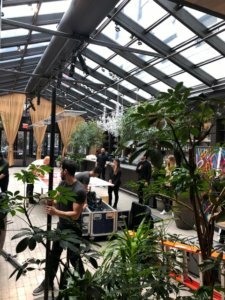 Each event that the crew from Kinney Group sets up is carefully reviewed and the best placement for lighting is decided upon. No two events are alike, and we treat each client as an individual. Another unique addition to this event was the use of a wall panel or a large image that we had specifically made to feature the logo for Hamilton Watches. The audio visuals that are used are specific to each event – making it a “one of a kind” production. “Thank you again for the support and for making our event memorable. Good to know you are also in LA, we will be in touch for sure!